Dimensions in Travel is delighted to offer cruises featuring bridge instructors/directors Peggy Tatro and Barbara Prior. 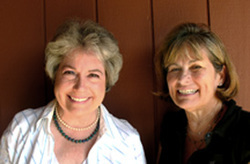 Peggy & Barbara are club owners in Marin County with many years of directing experience. They both teach bridge on a regular basis and are active members of the American Bridge Teachers Association. They have many loyal followers who enjoy their games and classes at Terra Linda Recreation Center in San Rafael. Cruising with Peggy and Barbara affords the opportunity for duplicate bridge in exotic locations with first-class amenities. The next bridge cruise is yet to be determined. If you'd like to be on the list to receive information when available, please email our travel consultant ​​Gale Staley. From Marsha & Bob S: "Here’s why we’re going with Peggy and Barbara again...they make sure the bridge is friendly yet stimulating. It’s nice to be able to socialize in a relaxed setting when not playing cards." From Fae K: "I was very pleased with your past cruises to Alaska, New England/Canada and Panama Canal. You make it fun and we also learn something. The mixed dining allows me to really get to know my fellow players other than at the bridge table." From Helen I: "I took the bridge cruise to Alaska and loved it. I recently sailed on Holland America’s Zaandam and thought the food was fabulous, the beds were very comfortable and enjoyed the feel of a much smaller cruise ship. I highly recommend this cruise to Hawaii." From Sheila L: "Our Panama Canal bridge cruise with Peggy and Barbara was wonderful in every way. I most appreciated that everything was handled for us to make it a stress-free vacation. The lessons and materials were terrific, as were the other players in the group. We still had lots of free time available to enjoy the other things to do on the ship and the interesting ports of call. I would definitely consider doing it again!"